The town I live in is full of fantastic independent coffee shops where you can sit and write, while coyly keeping one ear and one eye tuned to the people mooching in and out. 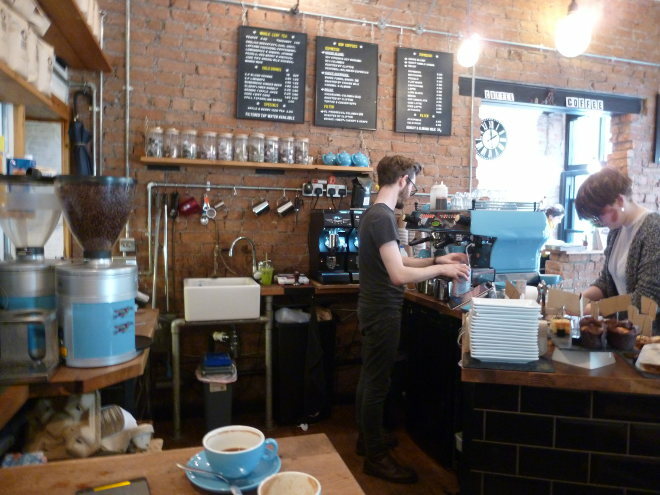 The one pictured above is Small Street Espresso, a fabulous but tiny establishment in Bristol. This week I urge you to emerge from your writer’s cave and head out to a more populated place. Take your portable writing device of choice (a notepad and pen should do it), and eavesdrop to your heart’s content. Who knows what might arise? This entry was posted in Writing prompts and tagged creative ideas, inspiration for writers, Small Street Espresso, story ideas, writing inspiration by Judy. Bookmark the permalink.